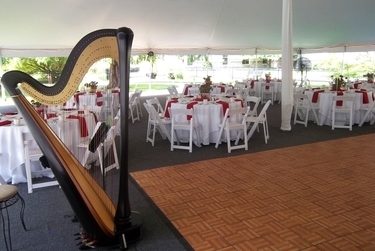 Harp music sets an elegant mood for your reception! I frequently play for cocktails and dinner, and can also play for longer periods of time. If you are not having a DJ or band for dancing, the harp is a beautiful and classy alternative, and can provide music for the entire event (even your first dance!). The harp music I play ranges from Bach to Sinatra to Bollywood to Metallica, and everything in between! Browse my Repertoire List, listen to the audio clips, and watch my videos to get an idea of the variety of music that is possible on the harp. When playing for receptions, I amplify the harp using my own sound system or the house system of your venue. The music will be loud enough to be heard, but your guests will still be able to converse with one another. Contact me to check availability or request a quote!